Wow! About a week ago I wouldn’t have thought that the ski season was going to start on schedule, but what a great start! 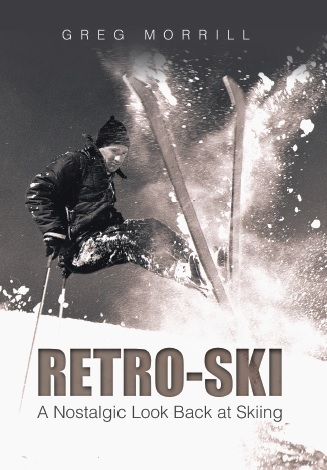 This season is special to me as it marks my 50th year as a “Vermont skier!” I moved to Vermont in July of 1968 so my first season was the winter of 1968-69. Throughout this RetroSki season I’ll often be sharing memories from that first season . That’s good news for me since I will probably be repeating stories I’ve used before. So it may be bad news for readers who’ve heard them before! At the beginning of 1968 I was a senior at the University of New Hampshire majoring in engineering math and minoring in skiing. Some of my classmates might say it was the other way around. Anyway, thanks to a summer job, I knew I wanted to be a computer programmer! Now I feel I have to explain how different 1968 was from current times. There were way more jobs than there were college graduates. We were all confident we’d get a job and in fact, we would have a choice of jobs. Oh, you’d also receive rejections, but they were nothing to get depressed over. In my fraternity it was common practice to paper your walls with the rejections. And of course there was the competition over who got the best salary offers. I probably should remind everyone that 1968 was a peak time in the Vietnam War so a job with a draft deferment could trump a higher salary offer. Sometime in the January/February timeframe I was reading an issue of SKIING magazine and came across an ad that in effect said “Do you like to ski? Come work at our Burlington, Vermont site. There are four major ski areas within an hour’s drive!” The company was IBM, of course. I immediately went to the UNH placement office, found when IBM would be interviewing on campus and signed up. I did get an offer from IBM Burlington and while it was a good offer, it wasn’t my highest offer. So I chose a job with a side benefit of skiing over a job with a higher salary. 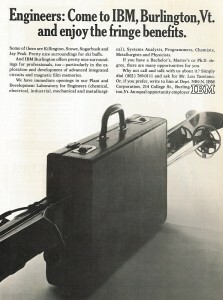 I moved to Burlington in July of 1968 to begin my career with IBM. I was surprised that most of my fellow new hires weren’t skiers. I assumed that skiing was a prime motivator to come to Burlington. However many of my fellow new hires were liberal arts majors who had never seen a computer and they took the job because it was the best offer they received. By autumn my anticipation of the ski season was building and there was one important item of business to take care of. I had left my beat-up pair of wooden Northland Commander skis in the furnace room at the fraternity so I needed a new pair of skis! I walked into Chuck and Jann Perkins’ Alpine Shop on Williston Road and bought a pair of 205 Hart Javelin GS skis. I paid full price, $200! That was the first time and the last time I ever paid full price for a pair of skis. I was ready and anxious to ski. Mother nature didn’t disappoint as the season came on early and hard. The season started in early November and by Thanksgiving I already had 6 days of skiing! And that had to be on weekends since I had no vacation as a new employee. 1968 was before any areas had significant snowmaking so that early skiing was all on natural snow. It was the beginning of the season that still holds the record for snowfall and snow depth on Mount Mansfield. The stake topped 100 inches by Christmas, dropped some after a thaw, and then went on to a peak of 148 inches. I had chosen a great job and was in skiing heaven! was working for Barrecrafters and outfitted is all with their poles. At some point we were synchro skiing in a line and I caught an edge and fell.